The Charlotte Motor Speedway is home to some of the best auto racing in the Carolinas. Located outside Charlotte, North Carolina the racetrack was built in 1959 and has been hosting NASCAR races since 1960. The racetrack is 1.5 miles long. A revolutionary lighting system installed in 1992 allowed Charlotte Motor Speedway to become the first modern speedway to host night racing. There is much more to do besides watch the race. The speedway has a Fan Zone which is a 10-acre area just outside the main entrance. Racing fans can play interactive games and purchase NASCAR merchandise. Kids will enjoy the bounce houses, petting zoo, and face painting located in the Play Zone. The Coca-Cola 600 race is part of the Monster Energy NASCAR Cup Series. Tickets are on sale now for the May 27th event. This year the Eli Young Band will be the pre-race concert and is included when you purchase race tickets. Many people who attend the race make a week of it and camp while they are there. Check out the speedway’s camping rules here. This is a popular, family-friendly campground. It is perfect for families of all sizes and is especially suitable for children. Quiet time is observed daily. The campground is located near the Turn 4 grandstands and is a standard, no-hookup facility. However, there are modern restrooms/showers located nearby. This is a centrally located, standard no-hookup campground. It is located near a convenience store and gas station. Campsites are on a first-come-first-serve basis. Extra tow vehicle passes can be purchased. This standard, no-hookup campground is located on the backside of the speedway. It is a short 15-minute walk to the track and trams also run before and after the race. If you like a more secluded campsite, this will suit you. Located less than a mile from the front stretch, this is the best campground for partying with family and friends. It is a standard, no-hookup campground. A tram runs from Rock City to the speedway before and after the race. If you would like to be in the middle of the action, then this is the place for you. 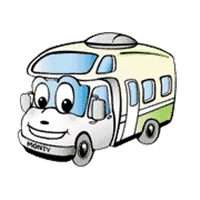 There are premium RV sites that offer electric only. You can view the race on the huge HDTV in the infield. These campsites are ideal for entertaining clients or visiting with family and friends. The Charlotte Motor Speedway’s philosophy is to make a fan’s visit the experience of a lifetime, whether it be watching the race, playing in the Fan Zone, looking through NASCAR memorabilia, viewing the race on the world’s largest HDTV, or camping right in the middle of all the action. North Carolina and Virginia offer some gorgeous sights for the RV vacationer. The best route for enjoying the views is the Blue Ridge Parkway. There is really no better way to experience these Eastern forests, mountains and blooming flowers. Attractions are numerous and just waiting for your visit. Traveling north on the byway begins in Asheville, North Carolina. Tour the art community and discover some amazing history by seeing the Biltmore Estate, a 250-room French Renaissance chateau. And if you love to wander garden trails go over to the North Carolina Arboretum. You will see a bonsai collection there that will have you yearning to learn that art. Take your time as you head north on the parkway. The overlooks allow you to gaze out on the diverse landscapes of the Great Smoky Mountains. When you reach Spruce Pine, North Carolina, stop at the Museum of North Carolina Minerals to look over the hundreds of minerals and gems that were found in this area. Kids with you? They will love the interactive displays at this museum, but so will the grownups. You will most certainly want to explore the Great Smoky Mountains National Park while here. The outdoor recreation in this park has no equal anywhere else. The rushing rivers and panoramic views serve to remind us of the fragility of our natural world and urge us to get out and enjoy it anytime we have the chance. You can hike, bike and fish here until your heart’s content. Take a guided tour of the Linville Caverns when you reach Marion, North Carolina on your journey. This is an attraction you won’t want to pass up as you are getting the unique opportunity to explore the inside of a mountain! Then you will continue on into Virginia to stop at the Natural Bridge. Hike the Cedar Creek Nature Trail. Be sure to begin conversation with the staff at Monacan Indian Village to find out what life was like here more than 300 years ago. You will find all kinds of options for RV camping as you travel the Blue Ridge Parkway. Plan ahead and scope out where you’ll stay as you move south to north. Each RV park is unique and all have great amenities. The best time of all awaits you in Shenandoah National Park. Take Skyline Drive for some breathtaking vistas. Don’t miss any one of the incredible overlooks. And don’t forget your camera! Cascading waterfalls in the park are a favorite and many come just to see them. There is really no end to all the outdoor recreation, marvelous wilderness views and wildlife you can enjoy in Shenandoah National Park. You would think that this is the perfect ending for a perfect vacation. However, one more thrill is ahead. In Front Royal, you can stop to get a guided tour of the Skyline Caverns. This has been a wonderful adventure and you are welcome back again any time for a fun RV vacation. Picture credits: The picture of the Blue Ridge Parkway is by the National Park Service. Spring in the Appalachian Mountains has no compare. What a thrill to spend a spring vacation in this gorgeous area! The Pisgah National Forest in North Carolina offers so much for those who want to get away from it all and bask in the beauty of nature. Towering peaks, sparkling waterfalls and dense forests all provide the inspiration you have needed all year. Hiking, fishing, biking or horseback riding provide only some of the outdoor fun you’ll find here. RV camping is plentiful too. Stay at the Black Mountain Campground where you will have lovely campsites with tables and fire rings with grills. Although there are no hookups, you will have showers and restrooms with flush toilets handy. The Appalachian Ranger District of the forest is one of the best areas to visit. This region stretches from the eastern edge of Great Smoky Mountain National Park to the Blue Ridge Parkway near Tennessee. Some of the best trails to hike or bike here are the Bear Pen Trail, with cascading waterfalls and lots of camera-ready sights, and the Staire Creek Trail, taking you through some lush forests with streams and more waterfalls. Near the Tennessee state line in the Appalachian Ranger District you can reach Max Patch, an incredible view from 4,629 feet up. This is an ideal place to fish, hike or view all the wildlife in this area. Wildflowers will be in bloom this time of year, too. Picnic, gaze out at Mount Mitchell and the Great Smoky Mountains. Views like you won’t believe! In the Pisgah Ranger District, the Lake Powhatan Recreation Area offers great fishing. There are thirteen man-made lakes and ponds into which you can cast a line. Hike the loop trails or take the more challenging trails for added excitement. When you take the Shut-In Trail, you will get to hike through a black bear sanctuary and get an experience like you’ve never had before. If you love fishing, catch some rainbow or brown trout in Bent Creek or the French Broad River. Lake Powhatan has plenty of great places to fish along the shore or from the fishing pier by the dam. Make your way to the North Carolina Arboretum, a lovely area with gardens, hiking trails and exhibits of plants, including a fine bonsai collection. There are 434 acres of inspiring beauty where you can collect your thoughts and prepare yourself for even more adventures to come. Of course, perhaps the greatest adventure is traveling the Blue Ridge Parkway. The scenic vistas will take your breath away. Originally built to connect Great Smoky Mountain National Park with Shenandoah National Park, this byway is a drive you will never forget – 469 miles of nature at its best. Another place to stop and explore is the Bent Creek Experimental Forest. Day hiking is a favorite here on the Cold Knob Connector Trail, Chestnut Cove Trail or Boyd Branch Trail. You can also fish, ride horses or just settle in for a delicious picnic at a quiet spot. Yes, nothing like a trip to Pisgah National Forest for an inspiring spring RV vacation! Inching northward as the spring weather warms, you will find North Carolina a marvelous destination for an RV trip. Croatan National Forest, on the eastern coast of the state, provides a wealth of wildlife, amazing pine forests and plenty of outdoor spring fun for the whole family. With more than 160,000 acres to explore, you will be hard put to do everything you’d like in one trip. RV camping (PDF) is no problem in the forest and you will find the site of your dreams to make your home base during your visit. You are surrounded by water in Croatan National Forest. You have the estuaries, tidal rivers, and swamps on all sides. The Bogue Sound has some of the best fishing around. Canoeing is always fun on the creeks and marshes. The wildlife you see will include black bears, deer, alligators and turkeys. Before you leave for Croatan National Forest, you should study up on one of the unusual plants you will come upon – the carnivorous Venus fly-trap. You will better understand how they survive as they get nutrients from insects instead of the boggy soil into which they extend their roots. A fascinating experience – to witness a Venus fly-trap in its natural habitat. Grab your mountain bike and head for the Neuse River Recreation Area within the forest. Here under the trees you will unwind and leave all your cares behind. It is a lovely spot on the shores of the river with a wonderful beach where you can spread a towel and listen to the waters running by. The Neuse River Trails offer easy hiking or biking along a paved trail and boardwalk. Cedar Point Recreation Area is another must-see. Located on the White Oak River with salt marshes surrounding, you will find saltwater fishing and much more in this spot. This is a wetland famous for its beauty and quietude. The coastal forest invites you in for some great walking and hiking. If you want a boat trip to outdo any other, try the Saltwater Adventure Trail where you can stop at a number of sights along the way. Even novices can enjoy this trip. A real adventure would be to explore the entire trail, but be prepared. It could take you up to seven days. Brice’s Creek Trail is a part of the Saltwater Adventure Trail and is an additional treat to your water adventures. However, if you want to fish, Catfish Lake is the place to go. There is a boat ramp where you can launch a flat bottom boat. Catch some catfish or perch! A North Carolina RV trip is well worth the time and energy, especially when you are going to visit Croatan National Forest. The coast will provide you with great weather for your spring adventure. You will discover a part of the country that is unique and beautiful. You will certainly want to return again for more fun. Picture credits: The sign for the Croatan National Forest is from the Wikimedia Commons. It is licensed under the Creative Commons Attribution 2.0 Generic license.